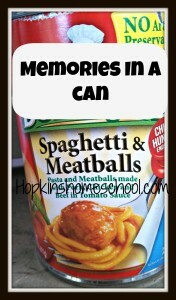 It is a simple can of spaghetti and meatballs, but with that can come so many memories for me. This one little can reminds me of days at the cabin. Great Grandma would always have the pantry stocked full for the grandkids. This little can reminds me of the date she would write on top of each one. We always knew when she went shopping because the date she bought it would be on top and her pantry was stocked like a grocery store, with the newest in the back. This can reminds me of my cousin, Derek, and the times we would be together at the cabin. It was a good thing Grandma was always stocked up, because I don't know what we would have done of there was only one can left! I remember standing around the stove with Derek and sharing the stories of the week with each other as we cooked our lunch, or snack, because Grandma didn't have the quick microwave. I still remember the laughing and fun that was had with these two angels over one simple can. 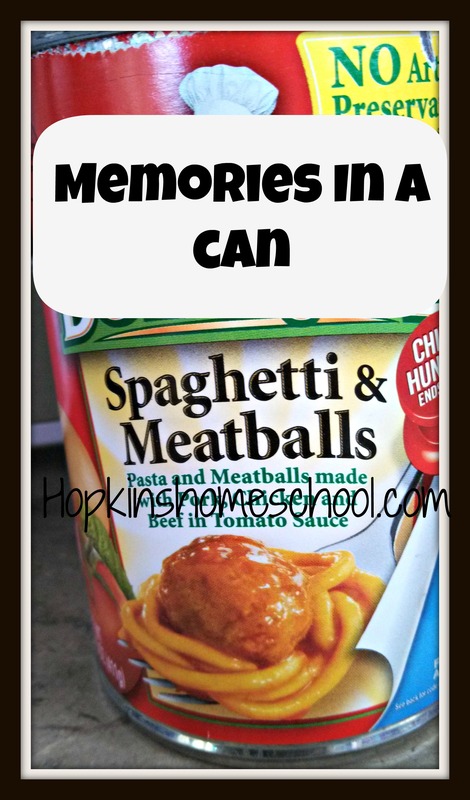 I pull the can out to make the meal, or snack, for my kids and I am brought back to the memories. How I love those memories, even if they are from a simple can!